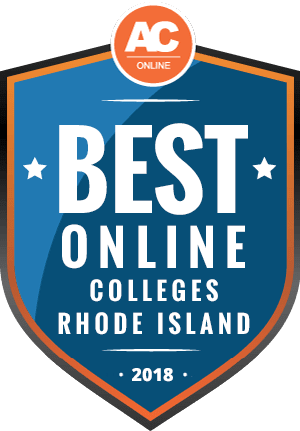 Why Choose Rhode Island for Online Higher Education? The economy of Rhode Island is transitioning away from manufacturing, and toward service, business, and healthcare. Educational requirements for the average Rhode Island worker are on the rise. According to current to state figures, less than 45% of Rhode Islanders hold a college degree. The state has implemented a new program called Higher Rhode Island to boost the overall education level in the state. Governor Gina Raimondo strives for 70% of Rhode Island residents to hold an associate degree or higher by 2025. The Higher Rhode Island initiative also aims to expand online education access. Rhode Island is home to some of the nation’s finest universities, including several top public schools, many of which offer web-based classes. Read on for a guide to online colleges in Rhode Island and to learn which ones are most affordable, where to find financial aid and enrollment information, the advantages of attending Rhode Island online universities for nonresident students, and frequently asked questions. Rhode Island may be the nation’s smallest state, but it already boasts an array of online educational opportunities through both public and private universities. Aimed at working students, these online degrees in Rhode Island allow single parents and busy professionals to advance their education on their own schedule. English as a second language opportunities provide Rhode Island’s many immigrants with opportunities to transition into English-speaking programs. Two-year programs also let undergraduate students earn general education credits inexpensively before transferring to four-year schools. Online colleges in Rhode Island offer a real cost advantage to students, since many schools extend discounts to distance learners. Traditionally, in-state students pay far less in tuition than nonresident students — often as much as a quarter or a third less. According to the National Center for Education Statistics, Rhode Island residents pay $11,000 to attend public, four-year universities, while their nonresident counterparts pay $30,000. However, many online universities in Rhode Island charge the same flat fee to degree candidates, no matter their state of residency. Rhode Islanders also enjoy discounted tuition in neighboring states, thanks to the New England Board of Higher Education tuition break program. Even in-state Rhode Island residents pay well above the national average of $8,778 for public university tuition and fees. As shown below, Rhode Island online schools — and especially two-year colleges — can provide state residents with significant savings. In some cases, distance students can save more than 70% on the fees their on-campus counterparts pay. However, some online schools in Rhode Island charge the same tuition for both online and on-campus learners. Others charge distant learners with technology fees, actually increasing the cost of digital education. Rhode Island universities host about 700 undergraduates and 500 graduate students from out of state. They enjoy the same quality education as state residents, but usually have to pay more for it. Rhode Island partakes in the New England tuition break program, which allows nonresident students to attend public universities in any of the five other participating New England states at a substantial discount, if their home states do not offer their chosen program. Rhode Island’s public universities join public schools in the five other New England states in the tuition break reciprocity agreement, which offers students from across the region the opportunity to attend universities in neighboring states at a discount. Rhode Islanders can enroll in programs at public schools in Maine, New Hampshire, Vermont, Massachusetts, or Connecticut at discounted rates, if public campuses in Rhode Island do not offer that same program. The tuition break agreement covers more than 800 undergrad and graduate programs between more than 80 participating colleges and universities. Full-time students taking advantage of this agreement can save as much as $8,033 in tuition. TMost of Rhode Island’s online campuses have obtained approval from the National Council for State Authorization Reciprocity Agreements (NC-SARA), through which states agree not to impose extra requirements on universities or institutions from other SARA states. Tuition rates are ultimately program and institution based. Ask someone from a prospective program about what rates apply to you specifically as a potential member of a program. Our ranking of affordable online colleges in Rhode Island includes an array of factors, combining quality and affordability. We studied cost, breadth of online programming, student-to-teacher ratio, graduation rate, financial aid, and job-placement services. All ranked schools hold accreditation from reputable agencies. We’ve answered some of the most common questions from prospective online students in Rhode Island below. Do Online Credits Cost More or Less in Rhode Island? Most online programs in Rhode Island reflect the school’s campus-based offerings — in fact, few schools distinguish between their online and on-campus classes, and many charge the same tuition for their on-campus and online learners. Some of Rhode Island’s private schools, such as Johnson and Wales, offer digital classes as part of their continuing studies programs. Johnson and Wales’ traditionally charges $32,091 in annual tuition, which breaks down to $2,139 per credit, at 15 credits a year. On the other hand, online credits at JWU cost only $333 per credit, providing students with substantial savings. In some cases, web-based courses may cost more than on-campus classes in Rhode Island. For example, online classes at Roger Williams’ University College cost $100 more per credit than the school’s on-campus evening classes. Which Rhode Island Schools Accept the Most Transfer Credits? Rhode Island’s Board of Education, along with several of the state’s public colleges and universities, created Rhode Island Transfers, which aims to simplify credit transfers between schools. One of the program’s main features, the joint admissions agreement, allows for the transfer of 60 credits from a community college to a public bachelor’s program. Rhode Island College, a public university, allows students to transfer up to 75 credits. Private Roger Williams University accepts up to 75 transfer credits from accredited four-year programs, and 60 from two-year schools. The University of Rhode Island accepts no more than 60, as does Providence College. Brown University imposes one of the most restrictive transfer policies in the state. The Ivy League institution does not accept credits from online courses, summer credits, or credits earned from dual-enrollment curricula, nor do they evaluate credits until students have enrolled. The Rhode Island School of Design limits undergraduate students to 12 transfer credits after they enroll. Will Any Online Colleges in Rhode Island Accept a GED? All of the state’s public colleges and universities, including the Community College of Rhode Island, the University of Rhode Island, and Rhode Island College accept the GED. The CCRI even schedules classes to help adults achieve their high school equivalency. Johnson and Wales and Roger Williams do accept the GED for their continuing education classes, and Roger Williams also hosts classes to help people earn it. The Rhode Island School of Design accepts high school equivalency diplomas in some cases. Providence College does not accept the GED. How Many Academic Terms per Year Do Online Colleges in Rhode Island Offer? Most online colleges in Rhode Island follow the traditional semester-based calendar. Many schools, like CCRI and URI, do hold online classes during an additional summer session. No schools feature the asynchronous, year-round, rolling-start classes found at universities elsewhere. Roger Williams University offers eight-week minimesters, which allow students to work at their own pace and earn degrees quickly. Which Online Colleges in Rhode Island Will Accept the FAFSA? Students seeking help paying for college should fill out the Free Application for Federal Student Aid (FAFSA), which is accepted by several Rhode Island online colleges. URI considers online learning an extension of its campus programs, and accepts the FAFSA as part of its usual admissions process. CCRI treats online students the same way. Providence College makes no distinction between online and on-campus students, and accepts the FAFSA as part of admissions. Salve Regina requires that its continuing education students file the FAFSA every year. JWU Online also encourages applicants to submit the federal aid form. Roger Williams’ School of Continuing Studies recommends that students fill out the FAFSA. Are There Any Free Online Classes I Can Take From Rhode Island Colleges? Several universities in Rhode Island offer free online classes using the massive open online course format (MOOC). Brown University, for example, sponsors BrownX in an attempt to provide educational opportunity and positive impacts on the community. Brown allows anyone to audit five MOOC classes, including introduction to engineering and design, beyond medical histories, fantastic places, unhuman humans, artful medicine, and the ethics of memory. Students can order a certificate of proof of completion for a small fee. RISDE, likewise, offers a MOOC class in Python programming through Kadenze. The University of Rhode Island features a few MOOC classes in subjects like nonviolence, biotechnology, copyright, and data science. Providence College hosts a conference exploring the free and open phenomenon of MOOCs. Rhode Island also provides an array of free online retraining-type classes. How Can I Find the Online Program Options at Rhode Island’s Colleges? The only way to learn about online course offerings in Rhode Island is to visit the website of each of the handful of online schools that offer web-based courses. Type in the phrase “online learning” in each website search field, and you’ll find the school’s digital offerings. Every prospective college student seeking financial aid should start by completing the FAFSA, which helps determine whether students qualify for aid. For many degree candidates, federal Pell Grants prove extremely helpful in paying for school. Local aid resources may prove helpful, as well. Across Rhode Island, communities, charitable organizations, and businesses offer scholarships and grants to give students a leg up on their college expenses. These can prove particularly helpful to students seeking advanced degrees, or those who may not otherwise qualify for a Pell Grant. Just as its name suggests, the Alperin scholarships go to Rhode Island residents who represent the first in their families to attend college. Based on need, these renewable scholarships help students attend accredited two- and four-year schools. Providing higher educational opportunities to African Americans, these need-based, renewable scholarships serve recent high school graduates and adults from Rhode Island. Applicants must pursue a healthcare degree at an accredited university or technical school. Established to honor the legacy of Rhode Island founder Roger Williams, these grants cater to students who understand and embody Williams’ legacy. Applicants must reside in Rhode Island, enroll in high school, and gain admission to an accredited university. Judges select students based on need, academic record, and their ability to communicate their own connection to Roger Williams. These scholarships fund travel and other opportunities for personal growth. Not intended for standard study-abroad programs, these funds can apply to internships, service programs, and other adventurers that broaden students’ perspectives. Successful applicants must provide a detailed description of their enrichment plan. Sponsored by the Rhode Island Foundation, the Frances L. Macartney Porter Fund helps single-parent Rhode Island residents attend school. Awarded to applicants from the Ocean State, or who attend school in Rhode Island, the grants give preference to those enrolled in trade schools.